Tracksounds: Win the WARHAMMER 40,000: SPACE MARINE Soundtrack! Win the WARHAMMER 40,000: SPACE MARINE Soundtrack! So you say you are a fan of our site? Prove it...and win! 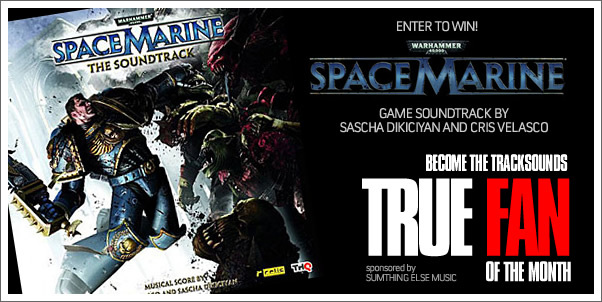 You can win one of the best video game soundtracks of 2011, WARHAMMER 40,000: SPACE MARINE by composers Sascha Dikiciyan and Cris Velasco! All you have to do is become Tracksounds' TRUE FAN OF THE MONTH! Be the fan with the most points at the end of October and that will earn you the title of True Fan of the Month! New York - September 15th, 2011 - Sumthing Else Music Works, Inc. proudly presents Warhammer® 40,000®: Space Marine® - The Soundtrack featuring the original music score from Relic EntertainmentTM's critically acclaimed 3rd person action/shooter published by THQ Inc. Warhammer 40,000: Space Marine - The Soundtrack is scheduled for release on September 20th, 2011 to retail outlets through Sumthing Else Music Works www.sumthing.com, and for digital download at www.sumthingdigital.com, Amazon MP3, iTunes® and other digital music sites. In Warhammer 40,000: Space Marine you are Captain Titus of the Ultramarines, humanity's last hope for survival in a war-ridden future. Step into the armor of this superhuman warrior and use a lethal combination of deadly weapons to crush overwhelming alien forces. Fight against the savage Orks and the unholy forces of Chaos in a brutally violent world based on one of the most popular science fiction fantasies. Inspired by the stunning cinematic visuals and visceral gameplay of Space Marine, the renowned duo of composers Sascha Dikiciyan (TRON: Evolution) and Cris Velasco (God of War Series) crafted an expansive emotional score featuring anthemic orchestral compositions and contemporary Hollywood music production, reflecting the epic scale of this rich, sci-fi fantasy.